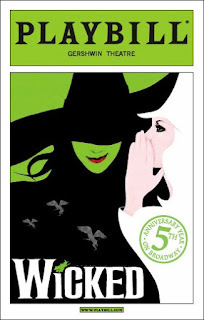 This October 30, Wicked is celebrating its fifth anniversary on Broadway! In honor of this momentous occasion, some special events have been lined up. For the first time ever, Playbill is changing its logo's trademark yellow color...to green of course. You can pre-order a copy here. They're also re-releasing the original cast album, with a bonus second CD, on the 28th of this month. Even the lights of the Empire State Building will turn green on 27 October. Broadwayworld gives us a run-down of the other festivities.